With the recent emergence of Performance Philosophy, I've been thinking about how best to navigate the Performance and Philosophy Working Group so as to carve out its own identity, make its projects relevant for its members, and continue its presence within Performance Philosophy international. The upcoming fluid states (PSi 21) conference will present something of a change in direction for the organization as a whole, so I'm using the next few months to do some "spring cleaning." This will entail updates to this website and more newsletter communications. If you have any questions or thoughts about the future direction of the group, I'd very much like to hear from you. You can write to me at w.daddario[at]gmail.com. I am very happy to be taking over duties as the Chair of this working group from Laura Cull. In order to share my ideas for the future of this group with you, I've decided to post the text of the letter I sent to Laura as my application for the position. You will notice that I am proposing numerous ways of activating the group, including the publication of research statements throughout the year, generated by clusters of working group participants. If you would like to compose one such statement with a group of your colleagues, please don't wait for me to contact you. Send me an email (moc.liamg|oiraddad.w#moc.liamg|oiraddad.w) with your suggestions. Building from your desire to transition the collective from a working-group-in-name-only to a de facto working group capable of functioning as a research consortium throughout the year, I would like to make my case for assuming the Chair position by outlining how I would actualize that transition. As is the case with many working groups, the initiative for undertaking research, chronicling it, writing about it, and sharing that information falls to the most active and ambitious members of the group. While the numbers of this select group within the group are frequently small, I believe that I, as the Chair, could suggest and/or assign tasks, projects, and the like to members of the working group, thereby creating a chain of Performance and Philosophy Working Group events that will be publicized throughout the year. For example, after receiving an overview of the group’s members from you, I would go about contacting seven or eight groups of people, inquiring about their current research foci, and asking if they would be willing to create a blog-post-length synopsis of their research at a certain point during the year that I would then publish to the working group through the listserve. These “groups” might exist as coherent pods of lecturers/professors and (post) graduate students within specific University homes, or they may consist of disparate individuals bound together by their common research interest/subject/topic. I would comb through the profiles of the working group’s current members to locate/assemble these groups. I would aim to publish one group’s report every month and use these reports as material around which to create a newsletter that I could mail to the working group. Complementary newsletter material might consist of notices for or reactions to conferences and events, links to interesting philosophy or performance writings (such as the list of links published by The Stone in the New York Times every week), and possibly announcements from Performance Philosophy. These newsletters would supply working group members with general knowledge about the research undertakings and interests of the group as a whole and hopefully stimulate discussions, research questions, and debates within the larger group. On another note, I could imagine creating a panel of reviewers from within the working group, a panel of people willing to offer editorial (or peer-review-like) feedback on in-process pieces (most likely written work) composed by working group members bound for publication. The purpose of this panel would be two-fold. First, it would serve the members of the working group seeking to publish papers on the intersections between philosophy and performance. In theory, though not in practice, the working groups in the American Society of Theatre Research (ASTR) provide this kind of support. Since many of ASTR’s working groups convene only once, however, they don’t have enough infrastructural support to provide writing mentorship throughout the year. I believe the PPWG could succeed where ASTR’s working groups do not. Second, this panel might act as a portal to the new Performance Philosophy online publication. Even if articles that move through the PPWG writing panel don’t end up at that new publication, Performance Philosophy would definitely benefit from knowing what working group members are working on, and possibly offer suggestions on other journals that might be a good match for their writing. This work-in-progress feedback loop might also make for good material for future anthologies and/or performance projects. The ideas outlined here would lead to activities I would happily perform as Chair in addition to the existing responsibilities that you undertake. I would like to learn more about the coordination of the conferences that happen throughout the year under the banner of the PPWG. Overall, I am keen to guide the working group and keep philosophical discussion alive within Performance Research international, where I know it is needed. Please accept this letter as my formal application for the Chair position, and please let me know if there is anything else I can do to further my application. As those of you who were at this year’s PSi in Leeds have already heard, the PSi Performance and Philosophy working group is undergoing a period of evolution or mutation! Founded in late 2008, the group now has over 300 international members – and has clearly already outgrown the title of a ‘working group’ (if that title ever really was appropriate for us). Performance Philosophy will be an international network open to all researchers concerned with the relationship between performance & philosophy. Amongst its activities we hope the network will launch a new website, journal and book series dedicated to Performance Philosophy and produce a variety of research events including conferences, seminars, festivals, summer intensives and so forth. Much is yet to be determined, but the official launch of the new association will take place at a Performance Philosophy conference event to be held at the University of Surrey in the UK from April 11-13th 2013. I hope you will be able to join us. However, I very much hope that the PSi Performance & Philosophy working group will continue to operate – contributing to the next PSi conference in Stanford and beyond. Indeed, I hope that with the formation of the new association, the working group might explore the value of the activities more conventionally associated with ‘working groups’ such as small scale discussions on focused research questions. But in order to concentrate on getting the new association ‘launched’ I would now like to step down from my role as Chair of the working group and to open it up to applications from the membership. The Chair of the working group will inherit the working group website http://psi-ppwg.wikidot.com/ and will be responsible for taking the working group into the future in whatever form s/he sees fit. S/he will collaborate with me on conceiving the working group’s contribution to PSi in Stanford – producing a CFP to be circulated to the membership in September. If you would like to apply for the role of Chair, please send a CV and statement of intent (max. 1 A4 page) to me at moc.oohay|lluckl#moc.oohay|lluckl by August 20th 2012. In your statement please include a description of how you envisage the future of the working group. The working group CFP for PSi 18 in Leeds is out now! I'm delighted to let you know that all 3 of our working group's panel proposals have been accepted for PSi 17. There are two panels under the heading "On Memory and Forgetting: Between Philosophy and Performance" - which were co-ordinated following an open call for papers. Papers were evaluated by myself, Dr. Alice Lagaay and Prof. Freddie Rokem. David Fancy on "Bergson, Deleuze, Memory and the Actor"
Kélina Gotman on "Metáphoric Thought: Stage Plays, Bacon, Beans"
Brandon Shaw on "Merleau-Ponty and the Dance of Re-membering"
Liz Tomlin with a paper entitled "Footprints in the Snow"
Joshua Abrams on "Teaching Children to Remember/Forget: Affective Futurity and Transmitting Trauma’s Missed Encounter"
Gabriella Calchi-Novati on "Performative Memories of ‘Unframed Gestures’"
Karoline Gritzner on "Recollection of/as Erasure: The Work of Memory in Thomas Bernhard’s Theatre"
Alvin Lim with a paper entitled "Sitting, Forgetting: Staging Forgetting, Sitting and Remembering"
Frederik le Roy on "A post-dramatic politics of memory?" Paul Ziche on "Constructing immediacy"
Laura Cull on "Beyond virtualism: multiplying presents in Deleuze, Kaprow and Clark"
Matthew Goulish with a paper entitled "A Clear Day and No Memories. Thoughts on Kerry Tribes HM"
I will post abstracts for all these panels on the working group website. There will also be a general meeting of the working group in Utrecht to which all are invited. Thanks to all those who applied to be part of the panels and I hope you will come and participate in discussions in Utrecht. Please see below for full details of PhD studentships available at Northumbria - including a project for which I will be the principal supervisor: on Deleuze and Beckett. The deadline for applications is Friday 29 October 2010. I would be grateful if you could pass on this information to any potential candidates. As Beckett scholar, Mary Bryden has noted, Gilles Deleuze’s philosophical engagement with Samuel Beckett’s work is particularly focused on his early novels and latterly with his television projects, rather than on the stage plays for which Beckett is best known to theatre scholars, such as: Waiting for Godot, Happy Days and Krapp’s Last Tape. Known for his antipathy towards spectatorship of live theatrical events, Deleuze ignores these canonical plays in favour of analyzing lesser-known works such as the novel Molloy and the television play, Quad. Correlatively, there are few examples in current scholarship – either theoretical or practical - of Deleuzian approaches to Beckett’s theatre. We would be pleased to accept proposals from suitably qualified candidates who are interested in exploring the implications of Deleuze’s philosophy – beyond his specific commentaries on Beckett – for understandings of Beckett’s theatre. In turn, the project may wish to consider how Beckett’s own theorization of his theatre practice might feedback onto understandings of Deleuze. The project may be designed to culminate in a purely written thesis or in both practical and written outcomes. The Department of Arts is a leading centre for supporting and energising creative practice and academic study informed by cultural partnerships and inter-disciplinary collaborations and promoted by national and international networks. Located in the centre of Newcastle upon Tyne, a vibrant city with a flourishing visual and performing arts scene and home to numerous creative and cultural venues, the aim of the Department of Arts is to make a difference to the artistic and cultural landscape through the delivery of excellence in student support, learning and teaching, dedicated research and scholarly activity, reflective professional practice, knowledge exchange and enterprise. The Department is home to 44 academic staff who are renowned specialists in their particular fields, and include fine artists, photographers and performers whose work is exhibited at venues across the world, and choreographers, writers and research active staff who publish widely and collaborate with the cultural sector and creative organizations internationally. In addition the Department supports over 25 doctoral students who make a significant contribution to research and knowledge exchange in the Department, and the work of the Department is supported by three experienced administrators. Our research and enterprise activity – whether through practice or in written form – explores in innovative and diverse ways the complexity of culture and the cultural field. Divisional staff were submitted against Art and Design and History of Art, Architecture and Design UoA in the 2008 RAE. The majority of their work was identified as of an international quality and much of it was acknowledged as internationally excellent or outstanding. The Department is offering a number of studentships, to commence in January 2011. These postgraduate Research studentships have been designed to provide students with high quality supervision from experts in their field and involvement in the vibrant research culture within the Department. • Access to funds to support research expenses (conferences or library visits). We are looking to recruit candidates of the highest quality, with the capability of submitting excellent theses within the standard PhD duration of 3 years. You will need to demonstrate a strong performance in your first degree (probably a first) as well as a good MA qualification. We will, however, consider candidates straight from undergraduate degrees where there is evidence of exceptional academic ability. Prospective candidates from overseas should contact us concerning entry requirements. Although studies of film music have proliferated over the past decade the uses of music within American independent cinema has been largely overlooked. The aim of this project will be to systematically chart both the use of pre-existing music and originally composed soundtracks created by musicians associated with the independent/alternative sector. In addition to mapping the ways in which such sounds and images intertwine to create particular meanings, the project will also investigate the broader cultural interconnections between these two spheres. To what extent are independent films advertised and/or discussed within music publications and vice versa? To what extent are particular ‘taste cultures’ being positioned by such processes and how does this relate to broader industrial developments both within American independent cinema and independent/alternative music? This PhD project will examine the continuing tradition of British realist film-making in the twenty-first century. Critical work on British social realist cinema, usually defined in terms of both style as content, has tended to focus upon key historical moments (such as the New Wave of the late 1950s and early 1960s) and personnel, such as Ken Loach and, more recently, Shane Meadows. Much of this work has dealt with the representation of place, region and gender, and this project will explore whether existing scholarly approaches have application to more recent films demonstrating the tendency towards realism. We welcome proposals from suitably qualified candidates who are interested in placing recent British film-making within its broader industrial and generic contexts. This PhD will also invite reflection on the usefulness and coherence of the “realist” categorisation, given the turn in contemporary British cinema towards hybridity. In doing so, it will contribute to wider debates about British cinema, authorship and history. The reopening of Japanese ports to international trade in 1858 after over 200 years of isolation resulted in a widespread enthusiasm for and consumption of all things Japanese, particularly between 1875-1900. This PhD would look at the introduction of exotic Japanese flora to Britain, its inspiration in Victorian design and appeal to middle class British consumers. Not only did the Japanese nursery export trade become a thriving industry, but its plant catalogues, the plants themselves, and their representations through precise botanical drawings or in Japanese woodblock prints and decorative art served as inspiration to British designers, such as the Silver Studio. Such examples offered not the motifs of dragons, cranes and the meandering clouds associated with an exotic Japan but the forms of lilies, camellias and hydrangeas that were more easily digestible by British middle class consumers with conservative aesthetic tastes. We would be pleased to accept proposals from suitably qualified candidates who are interested in exploring the ways in which Japanese flora and fauna were inspirational to Victorian designers, their consumption in the domestic interior, and how these more conservative designs relate to British ideas of Japan. A knowledge of botany or horticulture is desirable but not essential. Relatively little has been published to date in English on Korean horror cinema, and what has been discussed frequently concentrates on Korean horror film’s renaissance at the millennial fin-de-siècle. This PhD will take a broader perspective, considering the historical development of Korean horror from the 1960s to the present day. What are the social, political, economic and cultural contexts of Korean horror production, and how do these change over time? How can these films be characterised aesthetically, and what might their relation be to international markets? We would be pleased to accept proposals from suitably qualified candidates who are interested in utilising an interdisciplinary methodology to explore an exciting and nascent field of cinema studies, and who will contribute directly to the analysis of horror film and the burgeoning field of Korean Cinema Studies. Proficiency in Korean language is desirable but not essential. 6. Pressed, Stained, Slashed, Folded: Paper - A Medium for 21st. Century Fine Art Practice? Paper: Pressed, Stained, Slashed, Folded was the title of a recent exhibition staged by the Museum of Modern Art, New York which explored the potential of paper in fine art practice as demonstrated by a wide range of 20th century artists including Joseph Beuys, John Cage and Lucia Fontana. Applications are invited for a practice-led project that will investigate the relevance of paper as a contemporary fine art medium to the increasingly “screen” orientated world of the 21st century. Changing attitudes to handmade paper in terms of Western and Eastern aesthetics as discussed in Junichiro Tanizaki’s essay, In Praise of Shadows; its potential as an autonomous medium capable of conveying meaning and presence which takes it far beyond its most common function as a physical support for the drawn or painted image, and the role it might play in the perceived status of an artwork are all issues relevant to this project. The project will commence at a particularly pertinent and exciting time within the School of Arts and Social Sciences, corresponding with the development of the Paper Hatchery, a centre for excellence in paper and papermaking and their use in fine art practice, conservation and creative archiving. Themes reflecting the ephemeral in drawing have been addressed through employment of fugitive materials as in Beuys (Painting Version, 1976), Cage (Wild Edible Drawing, 1990) and Long (Mississippi Mud Drawing, 1992), and through simple manipulation of existing materials as in Creed (Sheet of Paper Folded and Unfolded, 2004). The multi-sensory nature of museum heritage provides an important focus for research at Northumbria University. Conferences also reflect current interest in this area: The Go-Between (Glamorgan University, 2009) debated the interpretive role of practitioners within the museum; Archive/Counter-Archive, Prato, (The Centre for Drawing, UK/ Monash University, 2009) will consider drawing and creative archiving. Applicants are invited to develop a project that will investigate the little explored area of transience, drawing and museology. Questions relating to how contemporary drawing practice might be used to reflect time, ambient light sources and archiving within museum environments and collections will be pertinent to this project. Applications from candidates interested in the potential of the multi-sensory nature of contemporary drawing practice will be particularly welcome. Thanks so much to those of you who participated in the Performance & Philosophy working group events at this year's PSi conference in Toronto. Though naturally I am biased :) I genuinely think these were some of the strongest sessions in the conference as a whole, so thank you in particular to all our presenters. In terms of follow-up, Matthew Goulish, Lin Hixson and I will be publishing the manifesto text we performed in Toronto as part of the forthcoming edited collection, Performance after Identity, edited by Matthew Causey and Fintan Walsh. I also have reason to be hopeful that some of our group's papers will be chosen for the issue of Performance Research that will document the conference (and will be distributed to delegates at PSi 17). Do have a look and then use this list as an opportunity to brainstorm ideas for what the working group might propose. My own preference would be to continue to explore the possibility of experimenting with the 'shift' format alongside 'panel' proposals. What kinds of workshops, performances or installations might we stage in order to think the relations between technology, memory and experience? I am also pursuing a number of different options regarding this year's inter-conference meeting which is likely to be held sometime in Spring 2011. More information will follow when I have it. Late on Monday 26 April, staff in Philosophy at Middlesex University in London were informed that the University executive are to close all Philosophy programmes: undergraduate, postgraduate and MPhil/PhD. "Philosophy is the highest research-rated subject at Middlesex University, with 65% of its research activity judged 'world-leading' or 'internationally excellent' in the UK government's recent Research Assessment Exercise. It is now widely recognised as one of the most important centres for the study of modern European philosophy anywhere in the English-speaking world. Its MA programmes in Philosophy have grown in recent years to become the largest in the UK, with 42 new students admitted in September 2009. Middlesex offers one of only a handful of programmes left in the UK that provides both research-driven and inclusive post-graduate teaching aimed at a wide range of students, specialist and non-specialist. It is also one of relatively few such programmes that remains financially viable, currently contributing close to half of its total income to the University's central administration… This is a shameful decision which essentially means the end of the Centre for Research in Modern European Philosophy, a hub for internationally renowned scholarship (http://www.web.mdx.ac.uk/crmep/; staff include Eric Alliez, Peter Hallward, Mark Kelly, Christian Kerslake, Peter Osborne and Stella Sandford). This act of wilful self-harm by the University must be resisted" (Radical Philosophy). The panel: “The Private Lives of Animals and Advocates"
The panel: "Exploring the Public Sphere"
The shift: "Public Philosophy: A Manifesto Workshop"
before - in Berlin. More details of the schedule for Berlin will follow shortly. Performance and Philosophy working group in Berlin on April 23-24th 2010. I also hope that many of you will be able to join us and participate in this exciting event. More details regarding the form and structure will follow in due course. the heart of Deleuze’s project, determining its terms, constructions, and arguments’ (ibid.). be’ through performance (Tassi 1998: n.p.). and Freddie Rokem’s Philosophers and Thespians: Thinking Performance. Thanks for the messages of support and feedback in relation to the Documents proposal. asap and provide us with your contribution, by email, by June 1 2009. Our aim is to publish the 1st issue on Issuu.com by September 1 2009. A new PSi Performance & Philosophy email-list has been created. We currently have 83 members from all over the world subscribed to the list, so its a great way to circulate information about any upcoming performance & philosophy events and publications or to share ideas about the field with other scholars. 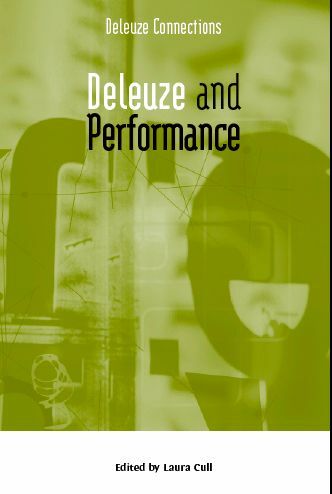 I'm also pleased to announce that Deleuze and Performance - a collection I have edited for Edinburgh University Press - will be out in June 2009. Was performance important to Deleuze? Is Deleuze important to performance; to its practical, as well as theoretical, research? What are the implications of Deleuze's philosophy of difference, process and becoming, for Performance Studies, a field in which many continue to privilege the notion of performance as representation, as anchored by its imitation of an identity: 'the world', 'the play', 'the self'? Deleuze and Performance is a collection of new essays dedicated to Deleuze's writing on theatre and to the productivity of his philosophy for (re)thinking performance. This book provides rigorous analyses of Deleuze's writings on theatre practitioners such as Artaud, Beckett and Carmelo Bene, as well as offering innovative readings of historical and contemporary performance including performance art, dance, new media performance, theatre and opera, which use Deleuze's concepts in exciting new ways. Can philosophy follow Deleuze in overcoming the antitheatrical tradition embedded in its history, perhaps even reconsidering what it means to think in the light of the embodied insights of performance's practitioners? Experts from the fields of Performance Studies and Deleuze Studies come together in this volume and strive to examine these and other issues in a manner that will be challenging, yet accessible to students and established scholars alike. Laura Cull is a PhD candidate in Drama at the University of Exeter, a part time lecturer in Performance at Northumbria University. She is also an artist, exhibiting internationally as an individual and as a member of the collective, SpRoUt.